Separate egg whites and yolks into two bowls. Whisk the whites until foamy and transfer to a cooking spray-coated 9x13 pan. Cover with foil and bake for 20 minutes, or until whites are set. Beat yolks until smooth and scramble in a non-stick pan on medium-low heat. In a food processor, blend yolks, mayonnaise, vinegar, mustard, sriracha, salt and pepper. Pulse until smooth. Transfer to a piping bag. Place a cutting board over the baking dish and flip to transfer the baked egg whites. 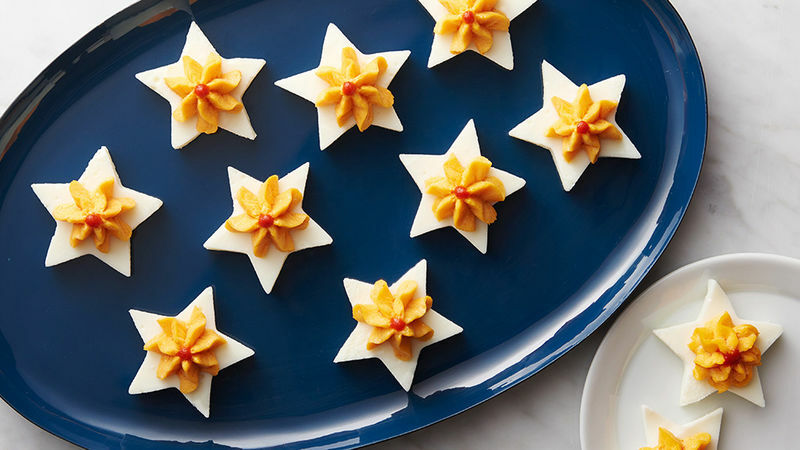 Using a star-shaped cookie cutter, cut out whites and transfer to platter. Pipe on yolk mixture and garnish with sriracha.